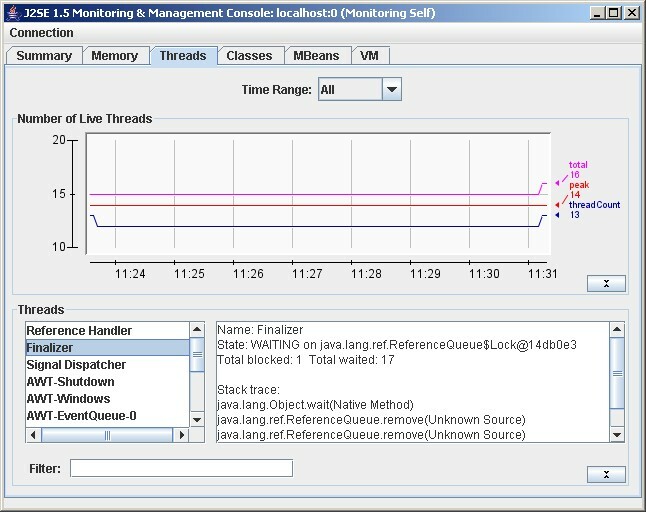 Jconsole is a JMX-compliant monitoring tool. It uses the extensive JMX instrumentation of the Java virtual machine to provide information on performance and resource consumption of applications running on the Java platform. The jconsole executable is in JDK_HOME/bin, where JDK_HOME is the directory where the JDK is installed. If this directory is on your system path, you can start the tool by simply typing jconsolein a command (shell) prompt. Otherwise, you have to type the full path to the executable file. You can use jconsole to monitor both local applications (those running on the same system as jconsole) and remote applications (those running on other systems). Note: Using jconsole to monitor a local application is useful for development and prototyping, but is not recommended for production environments, because jconsole itself consumes significant system resources. 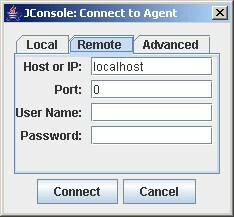 Remote monitoring is recommended to isolate the jconsole application from the platform being monitored. For a complete reference on jconsole command syntax, see jconsole - Java Monitoring and Management Console. On Unix or Linux systems, use the ps command to find the PID of java. On Windows systems, use Task Manager to find the PID of java or javaw. You can also use the jps command-line utility to determine PIDs. Both jconsole and the application must by executed by the same user name. The management and monitoring system uses the operating system's file permissions. If you don't specify a process ID, jconsole will automatically detect all local Java applications, and display a dialog box that lets you select the one you want to monitor (see the next section). For more information, see Local JMX Monitoring and Management. where hostName is the name of the system running the application and portNum is the port number you specified when you enabled the JMX agent when you started the JVM. For more information, see Remote JMX Monitoring and Management. If you do not specify a host name/port number combination, then jconsole will display a connection dialog box (see the next section) enabling you to enter a host name and port number. If you start jconsole with arguments specifying a JMX agent to which to connect, it will automatically start monitoring the specified JVM. You can connect to a different host at any time by choosingConnection | New Connection. and entering the necessary information. 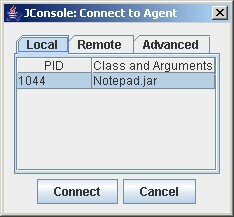 The local tab lists any JVMs running on the local system started with the same user ID as jconsole, along with their process ID and class/argument information. Select the application you want to monitor, then click Connect. Host name: name of the machine on which the JVM is running. Port number: the JMX agent port number you specified when you started the JVM. User name and password: the user name and password to use (required only if monitoring a JVM through a JMX agent that requires password authentication). 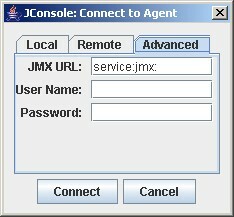 For information on setting the port number of the JMX agent, see Enabling the JMX Management Agent. For information on user names and passwords, see Using Password and Access Files. To monitor the JVM running jconsole, simply click Connect, using host localhost and the port zero (0). The advanced tab enables you to connect to other JMX agents (MBean servers) by specifying their JMX URL, and the user name and password. The syntax of a JMX URL is described in the API documentation for javax.management.remote.JMXServiceURL. where JAVA_HOME is the directory containing the JDK and connector-path is the directory or the jar file containing the classes not included in JDK 5.0 to be used by jconsole for connecting to a JMX agent. Summary tab: displays summary information on the JVM and monitored values. Memory tab: displays information on memory use. Threads tab: displays information on thread use. The following sections provide information on each tab. 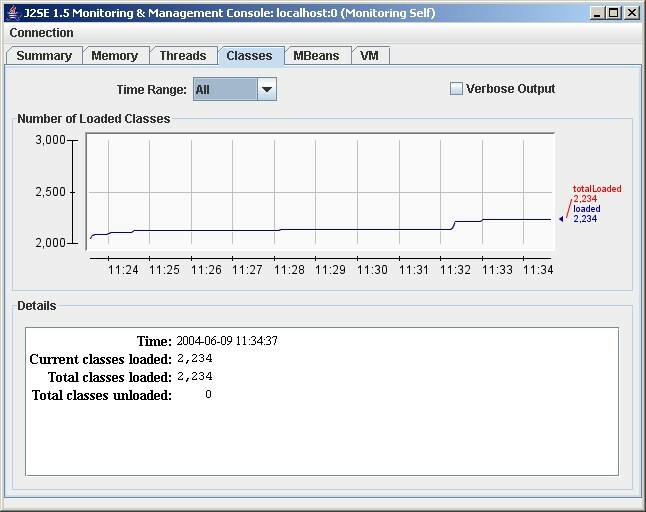 The Summary tab displays some key monitoring information on thread usage, memory consumption, and class loading, plus information on the JVM and operating system. Total compile time: the amount of time spent in just-in-time (JIT) compilation. Peak: Highest number of live threads since JVM started. Total started: Total number of threads started since JVM started (including daemon, non-daemon, and terminated). Current heap size: Number of Kbytes currently occupied by the heap. Maximum heap size: Maximum number of Kbytes occupied by the heap. Garbage collector information: Information on GC, including the garbage collector names, number of collections performed, and total time spent performing GC. Total classes loaded: Total number of classes loaded into memory since the JVM started, included those subsequently unloaded. Total classes unloaded: Number of classes unloaded from memory since the JVM started. Total physical memory: Amount of random-access memory (RAM) that the OS has. Free physical memory: Amount of free RAM the OS has. The Memory tab provides information on memory consumption and memory pools. 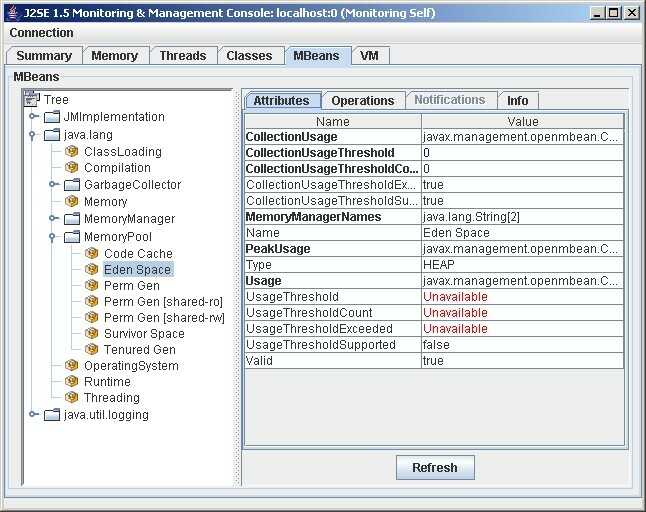 Eden Space (heap): pool from which memory is initially allocated for most objects. Survivor Space (heap): pool containing objects that have survived GC of eden space. Tenured Generation (heap): pool containing objects that have existed for some time in the survivor space. Permanent Generation (non-heap): holds all the reflective data of the virtual machine itself, such as class and method objects. With JVMs that use class data sharing, this generation is divided into read-only and read-write areas. Code Cache (non-heap): HotSpot JVM also includes a "code cache" containing memory used for compilation and storage of native code. For more information on these memory pools, see Garbage Collection. Used: the amount of memory currently used. Memory used includes the memory occupied by all objects including both reachable and unreachable objects. 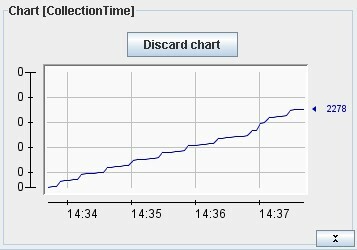 Committed: the amount of memory guaranteed to be available for use by the JVM. The amount of committed memory may change over time. The Java virtual machine may release memory to the system and committed could be less than the amount of memory initially allocated at startup. Committed will always be greater than or equal to used. Max: the maximum amount of memory that can be used for memory management. Its value may change or be undefined. A memory allocation may fail if the JVM attempts to increase the used memory to be greater than committed memory, even if the amount used is less than or equal to max (for example, when the system is low on virtual memory). 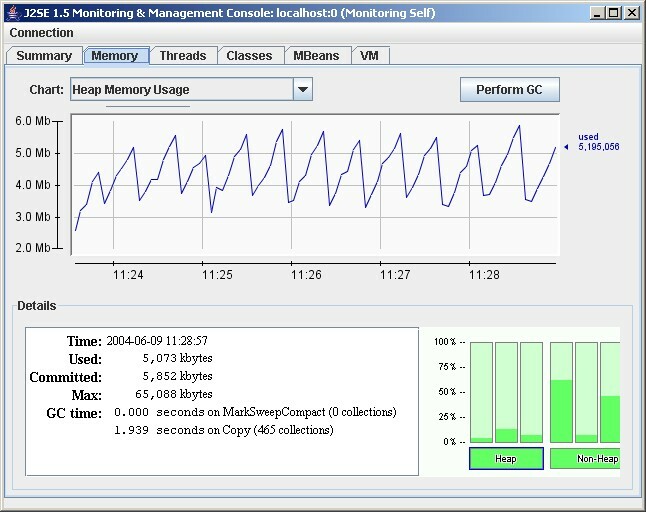 The bar chart at the lower right shows memory consumed by the memory pools in heap and non-heap memory. The bar will turn red when the memory used exceeds the memory usage threshold. You can set the memory usage threshold through an attribute of the MemoryMXBean. The JVM manages two kinds of memory: heap and non-heap memory, both created when it starts. Heap memory is the runtime data area from which the JVM allocates memory for all class instances and arrays. The heap may be of a fixed or variable size. The garbage collector is an automatic memory management system that reclaims heap memory for objects. Non-heap memory includes a method area shared among all threads and memory required for the internal processing or optimization for the JVM. It stores per-class structures such as a runtime constant pool, field and method data, and the code for methods and constructors. The method area is logically part of the heap but, depending on implementation, a JVM may not garbage collect or compact it. Like the heap, the method area may be of fixed or variable size. The memory for the method area does not need to be contiguous. In addition to the method area, a JVM implementation may require memory for internal processing or optimization which also belongs to non-heap memory. For example, the JIT compiler requires memory for storing the native machine code translated from the JVM code for high performance. Memory pools and memory managers are key aspects of the JVM memory system. A memory pool represents a memory area that the JVM manages. The JVM has at least one memory pool and it may create or remove memory pools during execution. A memory pool can belong to either heap or non-heap memory. 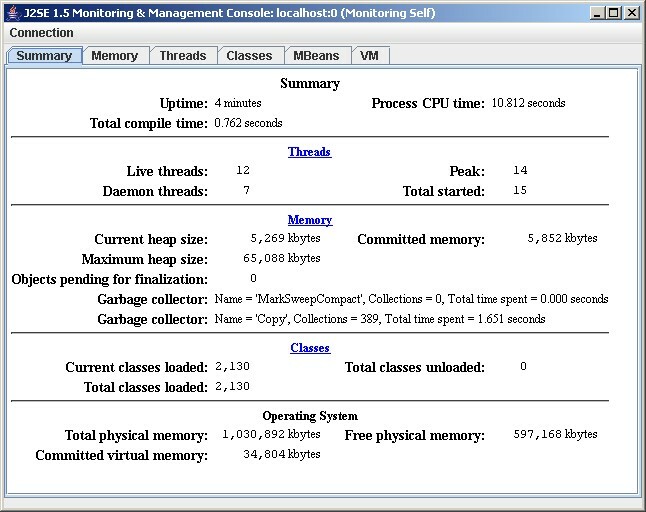 A memory manager manages one or more memory pools. The garbage collector is a type of memory manager responsible for reclaiming memory used by unreachable objects. A JVM may have one or more memory managers. It may add or remove memory managers during execution. A memory pool can be managed by more than one memory manager. Garbage collection (GC) is how the JVM frees memory occupied by objects that are no longer referenced. It is common to think of objects that have active references as being "alive" and un-referenced (or unreachable) objects as "dead." Garbage collection is the process of releasing memory used by the dead objects. The algorithms and parameters used by GC can have dramatic effects on performance. many objects that have short lives (for example, iterators and local variables). So, generational GC divides memory into several generations, and assigns each a memory pool. When a generation uses up its allotted memory, the VM performs a partial garbage collection (also called a minor collection) on that memory pool to reclaim memory used by dead objects. This partial GC is usually much faster than a full GC. The HotSpot VM defines two generations: the young generation (sometimes called the "nursery") and the old generation. The young generation consists of an "eden space" and two "survivor spaces." The VM initially assigns all objects to the eden space, and most objects die there. When it performs a minor GC, the VM moves any remaining objects from the eden space to one of the survivor spaces. The VM moves objects that live long enough in the survivor spaces to the "tenured" space in the old generation. When the tenured generation fills up, there is a full GC that is often much slower because it involves all live objects. The permanent generation holds all the reflective data of the virtual machine itself, such as class and method objects. The Threads tab provides information on thread use. The Threads list in the lower left lists all the active threads. If you enter a string in the Filter field, the Threads list will show only those threads whose name contains the string you enter. Click on the name of a thread in the Threads list to display information about that thread to the right, including the thread name, state, and stack trace. See java.lang.Thread for more information about threads and daemon threads. The Classes tab displays information on class loading. Red line is the total number of classes loaded (including those subsequently unloaded). Blue line is the current number of classes loaded. The Details section at the bottom of the tab displays the total number of classes loaded since the JVM started, the number currently loaded and the number unloaded. The MBean tab displays information on all the MBeans registered with the platform MBean server. The tree on the left shows all the MBeans, organized according to their objectNames. When you select an MBean in the tree, its attributes, operations, notifications and other information is displayed on the right. You can set the value of attributes, if they are writeable (the value will be displayed in blue). You can also invoke operations displayed in the Operations tab. 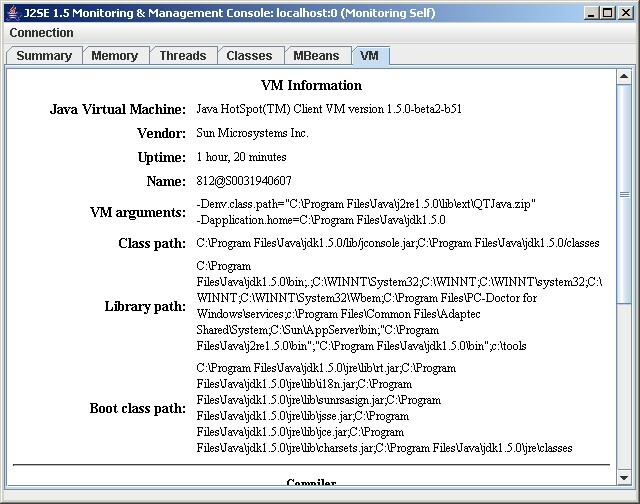 The VM tab provides information on the JVM. Uptime: Total amount of time since the JVM was started. Process CPU Time: Total amount of CPU time that the JVM has consumed since it was started. Total Compile Time: Total accumulated time spent in just-in-time (JIT) compilation. The JVM implementation determines when JIT compilation occurs. The Hotspot VM uses adaptive compilation, in which the VM launches an application using a standard interpreter, but then analyzes the code as it runs to detect performance bottlenecks, or "hot spots".